Hardcover, 8.5 x 10 in. / 272 pgs / 180 color / 30 bw. Text by Wolfgang Thaler, Maroje Mrdulja?, Vladimir Kulic. Socialist Yugoslavia was a country suspended between cultures, political systems and Cold War blocs, and as a result, in the early postwar years it produced a body of modernist architecture that defies easy classification and which has fascinated architecture historians since the dismantling of the Soviet bloc. 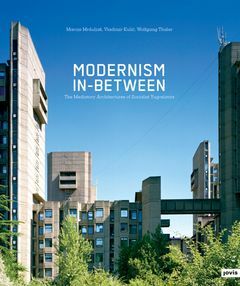 Modernism In-Between explores the historical “in-betweenness” of Yugoslavian modernism and the strategies architects used to mediate different--sometimes directly opposed--concepts of culture and architecture. Surveyed here is a wide range of topics, from city building and state representation, to the typologies of everyday life. Also discussed is the work of Yugoslavia's leading architects, who transformed their in-betweenness into a new quality: Edvard Ravnikar's seamless blending of such varied influences as Jo?e Ple?nik, Le Corbusier and Otto Wagner; Bogdan Bogdanovic's war memorials, which filtered deep-seated cultural archetypes through the lens of Surrealism; Juraj Neidhardt's efforts at forging a modern identity for Bosnia based on the vernacular Ottoman heritage; and Vjenceslav Richter's neo-avant-garde experiments, which provided some of the most convincing representations of Yugoslav socialism. Wolfgang Thaler's photographs document these and many other achievements. "Yugoslavia is certainly the most miraculous of the "defunct countries" of the recent past: although it started to disintegrate more than twenty years ago, its past appears more modern than the present of many of its successor states, not only in an aesthetic but also in a more general, intellectual sense. Or is it a mere Fata Morgana of our senses, based on a selective perception? This book gives an answer that is supported by a careful analysis of a vast material, and not by an elegiac meditation on tempi passati. It shows a remarkable will of the architects to associate themselves with the program of modernism, but "floating" in an in-between, mediatory condition rather than fully embracing its ideology. This relationship to modernism meant broader horizons and the rejection of any concessions to the spirit of the province-while at the same time not shying away from its mythologies. Even if we accept that the past is not available to us in its immediacy, the texts and images in this book can conjure the power of the vision of a modern culture that was not monolithic, but open, generous, challenging, and inspiring; it had all the qualities that provincialism lacks, rejects, and wants to erase." "Lucid and compelling, written in a fluent style, this meticulously researched book, with its full array of beautiful photographs, is a landmark study of a place and time that produced stirring and original architecture. It is a convincing and insightful portrait of the era and a major contribution to our understanding of the broader history of modernism. 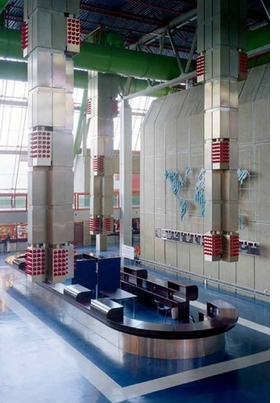 In the end, the Yugoslav state was a failed political experiment, but in cultural terms-and especially in architectural terms-the attempt to make something 'in-between,' to find a new 'intermediate' aesthetic, led to great innovation and discovery. What one sees in these pages is revelatory, a still mostly unknown building scene of striking power and freshness." Featured image is reproduced from Modernism In-Between. FORMAT: Hbk, 8.5 x 10 in. / 272 pgs / 180 color / 30 b&w.